In this era of fake news and misinformation, it is good to be reminded of how the internet is being used to improve the ways in which the ideals of democracy are translated into action. One such example is the use of digital technologies to enable people to engage with urban challenges in their neighbourhoods via civic apps. Sarah Giest and Ansgar Koene describe how the success of civic apps depends on how effectively they facilitate the dynamic elements of citizen engagement and the citizen-to-citizen dimension in particular. This is a new post in the Data and Society series. In a time of short days, long, gloomy nights and a seemingly endless stream of news stories about filter-bubbles, corporate and government surveillance, ‘fake news’, and algorithm-driven discrimination it can seem as if the internet does nothing except undermine human rights and democracy. At such times it can be good to remind ourselves of the positive work presented at conferences like Data for Policy; showcasing how the internet, and its associated data flows, are being used to improve the ways in which the ideals of democracy are translated into action. One example of such a development is the increasing use of digital technologies to enable people to engage with urban challenges in their neighbourhoods through the use of civic apps, digital tools that facilitate the communication among citizens and between government and citizens. Many of these apps have failed due to low or short-term uptake by citizens and design choices that limit engagement opportunities. Many government apps act solely as online platforms for information and data stored in other forms and focus on either distributing information to citizens or receiving alerts about local problems rather than facilitating citizen engagement. For example, apps where citizens can highlight an issue, such as a pothole that requires fixing in their neighbourhood, but don’t allow them to also see if any neighbours have put in a similar request to have the street fixed nor receive an update on public follow-up. 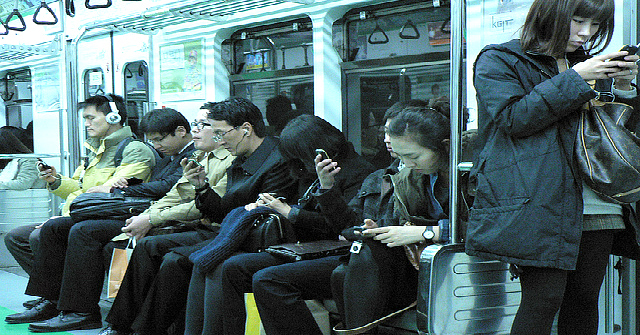 Image credit: Everyone is staring at their phone, on the Seoul Metro, Seoul, Korea November 2010 by Marc Smith. This work is licensed under a CC BY 2.0 license. Low or no engagement can result from individual motivations of citizens, but can also be the reaction to the way that policymakers engage, for example by not making visible changes or publishing (aggregated) results of what a larger group of people have been voicing. Many government apps act as a ‘mobile gateway’ to information and data stored in other forms (Breeden, 2012) and focus on either distributing information to citizens or receiving alerts about local problems from them. They rarely facilitate the dynamic elements of citizen engagement. In short, they fail to address the citizen-to-citizen dimension of engagement (Halpern and Gibbs, 2013). Part of such a citizen-to-citizen interaction that civic engagement platforms could provide is to facilitate participant consideration of diverse viewpoints to mitigate negative impacts that ‘filter bubbles’ can have in democratic processes (Noveck, 2016; Nelimarkka et al., 2014). Looking more closely at two successful apps, Citizens Connect and Neighborland, which have been used in several US cities, it seems that possible success mechanisms are linked to: 1) a low threshold for engagement; and 2) some type of feedback or response by government and/or other citizens. Neighborland is a self-defined communications platform that aims to empower organizations to collaborate with their stakeholders in an accessible, participatory, and equitable way. It largely works with place-based projects and combines physical and online tools. Neighborland also enables users to support citizen-created initiatives by offering a simple endorsement button. Citizens Connect, launched in 2009, is a mobile application that allows residents to report public issues from their phones into their city’s work order management system. The effort to report issues is minimized by pre-identifying the location of the user and offering a range of issues to report. Citizens Connect also offers a follow-up on the request in the form of a picture or report. The literature and the two apps both point towards a research gap in how citizens use these apps over time and what their motivation is to either stop or continue its usage. The two approaches highlighted in Citizens Connect and Neighborland suggest that some type of gratification mechanism can make these apps sustainable. These include, for example, gaining support from other citizens for a project proposed to the city (endorsements). There is further a closed feedback loop in the sense that citizens can follow-up on their complaints or projects. These gratification mechanisms need to be linked up with the role of political efficacy in civic engagement in the sense that the more an individual has the sense of personal competence in influencing the political system, the more they will engage. Visibility of change: can the app user see the change in the neighbourhood/policy/government institution? Visibility of engagement: can the app user interact with other citizens and see what they are suggesting/ commenting? Equal opportunities: is the effect of online bias mitigated through, for example, an uncertainty- minimizing sampling algorithm that strategically displays suggestions from both individuals who hold similar and dissimilar viewpoints? If the answer to these questions is “yes”, we hypothesize that such an app might have a long-lasting and engaging effect on the community it is aiming to serve and might ultimately support both citizens and policymakers in their efforts. This blog post is based on a conference paper presented at the Data for Policy conference at Cambridge University. Dr Sarah Giest is an Assistant Professor at the Leiden University Institute of Public Administration where she conducts research on how data information impacts policy design in the urban context. Her ORCID iD is 0000-0001-8201-6943. Dr Ansgar Koene is Senior Research Fellow at the University of Nottingham Horizon Digital Economy Research Institute and Co-I on the UnBias project where he focuses on policy implications of algorithm mediated information flows. His ORCID iD is 0000-0002-7608-623X.